Tunisia is a beautiful country. 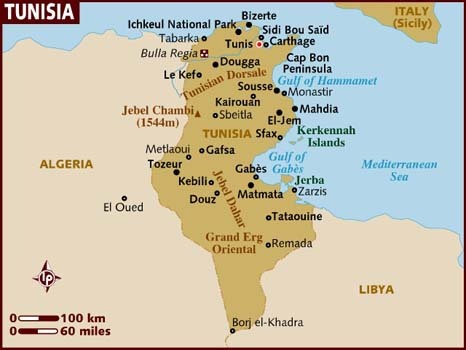 It is composed of desert, sandy beaches on the Mediterranean and mountains in the North near the Algerian border. Its people are very nice, hospitable, and treat foreigners very well. I know because we lived there for 4 years and enjoyed every minute of them. Their cuisine is fantastic, Near Eastern with the most famous dish "The Couscous" but also the Bric A L'oeuf is misterious, and delicious. It consists of a large round filo type pastry fried with a raw egg, canned tuna, parsley, hot chili, and any other fine blend of ingredients stuffing. My friends living in North Africa do not need my explanation. However all you guys living in French speaking countries will definitely have Tunisian or Algerian shops where you can buy the bric pastry. If however you cannot find this special round bric pastry, then the closest thing is the Greek filo. - 2 sheets of rectangular Greek filo pastry cut in half giving you two double sheet squares. - Lightest oil for frying. Although in Tunisia they use olive oil everywhere. - Heat the oil but not very much, just enough to fry the filo without instantly burning. - Using your left hand hold the corner of one square (composed of two filo sheets) and drop half the square forming a triangle on the oil surface, quickly slip the egg in, then quickly cover the egg with the rest of the filo which you are holding in your left hand. It will form a right angled triangle. Holding Square Filo From The Corner. The Filo Slip In The Egg. - With a flat heat resistant utensil, press the the filo together. As in my photos. - Take out quickly before it gets burnt. - Place the bric á l'oeuf on kitchen paper to absorb the extra oil. SoThe Egg Does Not Spill. This is a typical entrée in Tunisia before you hit the Lamb Couscous. One of my future recipes.